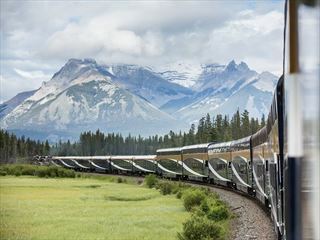 If wildlife and remarkably lush, breathtaking scenery is what you’re after, this tour surely delivers that and a whole lot more. The next 10 days will immerse you in a world of soaring jagged mountains, wild coastlines, and an array of greens like you’ve never seen before. 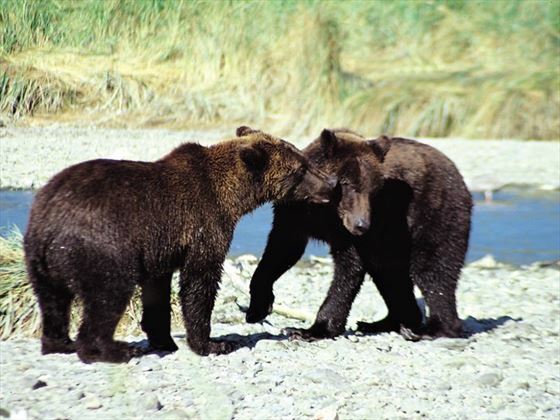 You’ll have the chance to see everything from grizzly and black bear to whales, sea lions and bald eagles in their natural habitats, and enjoy a number of interesting cultural attractions as well. The group will be a maximum of 12 people and you’ll be escorted by a professional tour leader who will be your expert guide, allowing you to maximize the opportunities of wildlife viewing and immersing yourself in this beautiful region. View the last remains of a temperate rainforest that covered Vancouver Island more than a thousand years ago. Head out on a whale observation cruise in Pacific Rim National Park by Zodiac boat to watch for humpback, grey and orca whales, and visit sheltered bays to search for black bears that feed along the shore. Take the short ferry ride to Quadra Island, where you can paddle the surrounding waters along the shoreline while your guide points out the many marine creatures that live here. 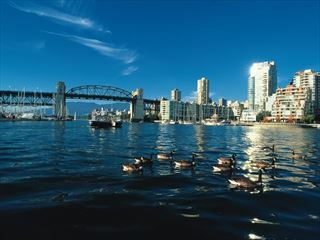 Welcome to Vancouver, British Columbia, often called Canada’s most beautiful city, and surely one of the world’s most stunning. Everywhere you turn, there is grand mountain and ocean scenery, yet it’s also a cosmopolitan city with a wealth of cultural attractions and fine restaurants, leading some to compare it to Manhattan but with mountains. 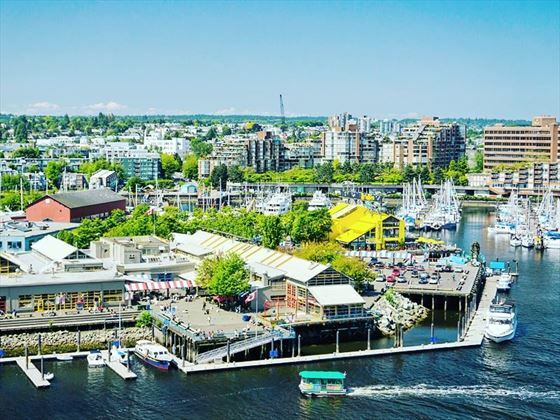 Your first full day will kick off with a guided tour of Vancouver, including historic Gastown and its magnificent collection of Victorian buildings, and Granville Island, one of the city’s most beloved neighbourhoods and a beautiful place to watch the boats head back and forth in English Bay. 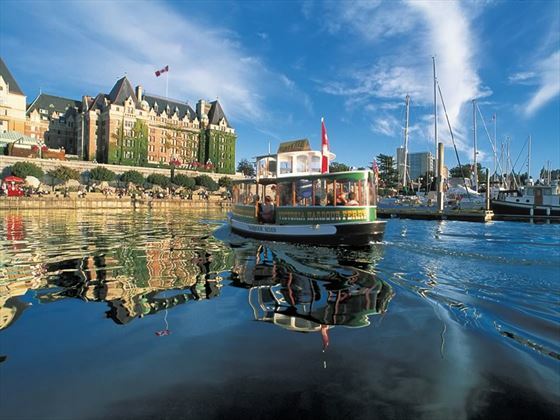 In the afternoon, you’ll board the ferry for a 90-minute journey across the Strait of Georgia to Nanaimo, Vancouver Island’s central hub city and your destination for the night. 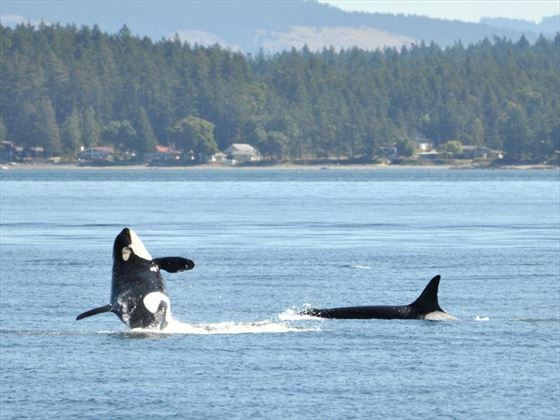 Be sure to watch for the orca whales and porpoises that are often spotted along the way. If you want to stretch your legs when you arrive, walk the Nanaimo seawall a walkway that runs alongside the waterfront with a number of eateries and craft shops near the Bastion. Leaving Nanaimo, you’ll have the opportunity to visit Horn Lake Caves Provincial Park, famous for its more than 1,000 caves. You can discover this breathtaking underground world while learning about the caves unique history and geology, or stay above ground and hike the Phil Whitfield Interpretive Trail to explore the area’s interesting geology features. Afterwards, it’s time to head to your destination for the next three nights, Ucluelet, on the west coast of the island. Along the way, stop at Cathedral Grove Provincial Park, where you’ll view a rare and endangered remnant of an ancient Douglas fir ecosystem, the last remains of a temperate rainforest that covered Vancouver Island more than a thousand years ago. Take a stroll along the trails to view the towering giant Douglas firs and unique rock formations. 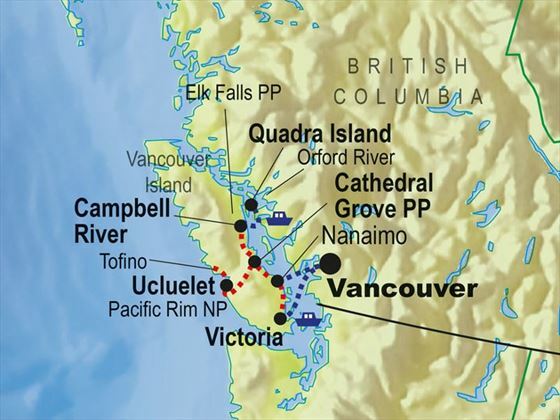 Also on the itinerary is Pacific Rim National Park, located on the island’s wild west coast against a backdrop of lush emerald rain forest and jaw-dropping mountains, with miles of beautifully rugged beaches and rocky islands that sit just offshore. This is a place made for nature and wildlife lovers, with a wide array of both land and sea creatures, including black bear, bald eagles, black tail deer, endangered leather turtles, many different whale species, seals, sea lions and more. 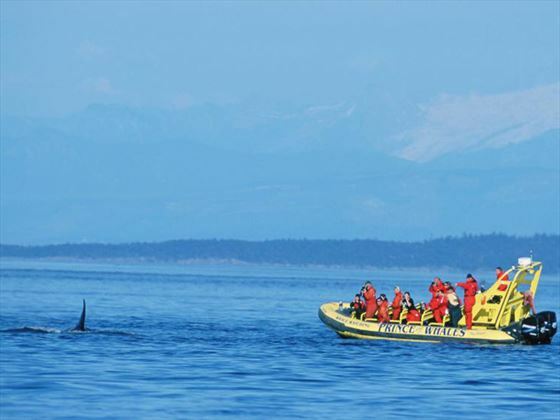 You’ll have the opportunity for a closer look by heading out on a whale observation cruise by Zodiac boat, watching for the frequently spotted humpback and grey whales along with the occasional orca whale and other marine life too. Next is a visit to Tofino, a picturesque outdoor retreat in the park known as the “jewel of Canada’s west coast.” You’ll stroll through breathtaking Tofino Botanical Gardens, gazing at the songbirds and hummingbirds, and watching out for the bald eagles that are sometimes spotted soaring above. Afterward, it’s time to journey into the sheltered bays of Clayoquot Sound in your Zodiac boat, searching for black bears that feed on shellfish and crustaceans along the shore. It’s time to say goodbye to Ucluelet, and hello to Campbell River, AKA the “Salmon Capital of the World,” where you’ll still for the next three nights. But first, enjoy a short walk in Elk Falls Provincial Park, renowned for its majestic waterfalls and spectacular hiking trails. Once in Campbell River, you’ll understand how it got its other name – the river is filled with five different salmon species. The fish attract bald eagles and kingfishers that can often be seen along its banks and perched in the trees overhead. While fishing is the biggest draw here, there are also a number of boutiques, art galleries and farmers markets to explore, and the Museum at Campbell River is a great place to find out more about the living history of the region and the rich cultures of the First Nations groups. In the morning, you’ll have the chance to see some of the most impressive wildlife in the province in its natural habitat by taking a boat excursion to the glacial green waters of the Orford River that lie in stunningly pristine fjord known as Bute Inlet. Along the way, black bear, whales and other marine life are often spotted as well. 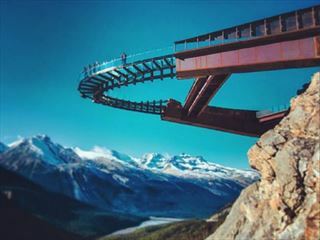 This is the home of the largest concentration of grizzly bears in British Columbia, and you’ll stand in awe on the viewing platform as you watch the bears, and sometimes cubs too, drawn here for the abundance of spawning salmon. While the bears certainly steal the show, the surrounding scenery is also sure to impress. Yet another unforgettable experience awaits, accessed via a 10-minute ferry ride to Quadra Island, part of the Discovery Islands off Vancouver Island’s east coast. Here you’ll spend the day traversing the scenic trails and beaches on foot, or you can get out on the water and explore the surrounding waters and the shoreline via kayak with marine life observation guides. You’ll have the chance to view interesting sea creatures like sea urchins, jellyfish and starfish, as well as sea lions, seals, porpoise dolphins and whales, along with that hard-to-take-your-eyes-off-of scenery. Sadly, your time on Vancouver Island comes to an end as you’ll journey to Victoria to board the ferry across the Strait of Georgia and back to the city of Vancouver, taking in gorgeous views of the skyline as you near your final destination. Before your adventure ends, you may want to take a walk through Stanley Park, with its 5.5-mile-long seawall that hugging the waterfront an outstanding way to experience many of its highlights like the famous totem poles, the 32-million-year-old Siwash Rock that rises from the water and the “Girl in a Wetsuit,” a modern-day mermaid sculpture. Please note that due to the time that the tour ends, your return flight must be booked for departure after 9pm. Or why not speak stay an extra night? Speak to one of our sales experts who will be happy to advise you.